Ivy Flindt is touched by beauty and seduced by danger. Their music is delicate yet powerful, intimate and full of integrity. Cate Martin and Micha Holland grew to be close companions along the road, until they felt it was well and truly time to record their debut album „In Every Move“. Choosing a producer was fairly easy. They studied the back cover of their all-time favourite album „Long gone before daylight“ by The Cardigans and knew who to call: Per Sunding. Dreams came true and the following year was dedicated to recording at Tambourine Studios Malmö and Atlantis-Studion Stockholm. The collaboration between Per Sunding and Ivy Flindt was both: pure pain and pure pleasure, intense and joyful. Way out of the comfort zone you get the real feeling! 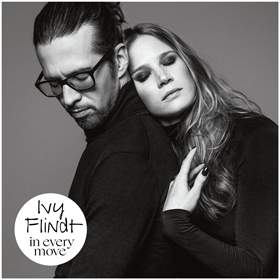 In August this year Ivy Flindt will release „In Every Move“ via Marland Records/The Orchard. Cate Martin and Micha Holland’s music is part of a bigger picture: a pioneering quest, an inspiring attitude to life, venturing into the world. 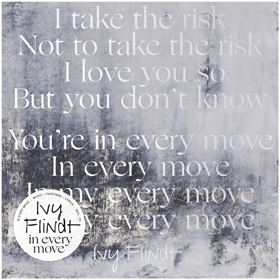 Composing, photography and painting – that’s what they are engaged in and what they call: Ivy Flindt. Ivy Flindt comes to life when Cate and Micha start to create. After playing many headliner shows in Germany throughout the years and also opening shows for artists such as Kashmir, Other Lives, Vienna Teng and Melanie Pain (Nouvelle Vague), Ivy Flindt were invited to tour Russia in 2017, where they played shows all along the way from Moscow heading east to Novosibirsk, Siberia. This year’s ALBUM RELEASE TOUR „In Every Move“ will start in August! The tour will be presented by the newspaper taz and the Berlin based magazin Schall. Cate Martin graduated with honors in literature and philosophy. She prefers poetry to prose ‘cause it’s shorter. She was not allowed to have a dog when she was a child, so she spent her days playing the piano. As soon as she had turned 18, she got herself a Doberman. Micha Holland is a freelancing guitar and bass player who would love to play more mandolin but is not allowed to do so at Ivy Flindt. His VW campervan allows him to stay and leave whenever he wants to.